Primary Natural Resources natural gas, arable land, coal. 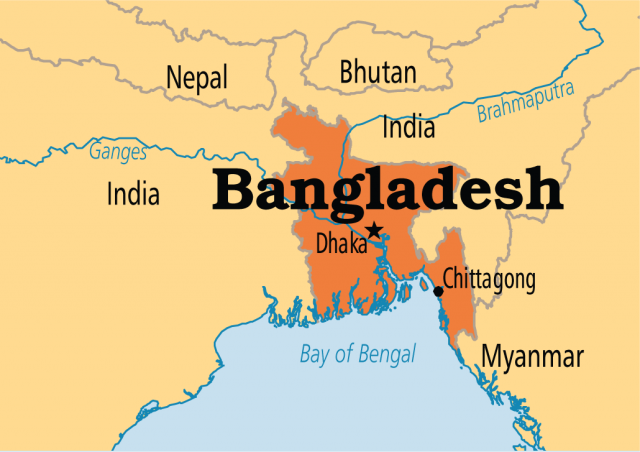 BANGLADESH HAS been an independent country since 1971, when it seceded from PAKISTAN in South Asia. Prior to Muslim occupation (1203), its people were believers of Hinduism and Buddhism. With British colonization since 1757, Western influence included a British educational system and the introduction of English, which even today remains the language of the elites. The BAY OF BENGAL lies to the south, INDIA is to the east, west, and north. It has a limited boundary with MYANMAR (Burma). Ninety-eight percent of Bangladeshis speak Bengali (Bangla), the national language; 83 percent are Muslims and 16 percent Hindus. Three major rivers of the country are the GANGES, Brahmaputra, and Meghna. They discharge an enormous amount of water to the Bay of Bengal, only surpassed by the AMAZON and CONGO rivers. The southern part of the country consists of a DELTA formed by the confluence of the Ganges and Brahmaputra rivers. North-central and southeastern parts are mountainous. Most of the country is low-lying and riverine and susceptible to flooding during the rainy season, which starts in June and lasts until the beginning of October. Its tropical monsoon climate is erratic; some years cause heavy rainfall; some are normal or have occasional draughts. Its annual rainfall averages 60–80 in (152–203 cm). Floods and occasional droughts ravage the country, bringing about misery. Cyclones (hurricanes) originating from the Bay of Bengal just before and after the rainy season, cause heavy damage in the southern part. Because of high rural population density, land is intensively cultivated. As one of the most densely populated countries of the world, Bangladesh suffers from severe overpopulation: 80 percent of country’s labor force is employed in agriculture. Rice is the principal food crop; rural Bangladeshis often eat three meals of rice every day. A third of Bangladeshis live below the poverty line. Dhaka, with an estimated population of about 12 million, is the capital and pacesetter of the country. Since its independence and the assassination of the founder of Bangladesh, Sheikh Mujibur Rahman (father of the nation), in 1975, the country has alternated democracy with military dictatorships.